Dalia Mogahed: How Does Speaking Up Change Minds? Part 5 of the TED Radio Hour episode Speaking Up. After 9/11, Dalia Mogahed saw an increase in negative perceptions of Muslims in the media, so she made it her job to speak up for her faith and fight prejudice with better understanding. Dalia Mogahed is Director of Research at the Institute for Social Policy and Understanding. Her work focuses on research and thought leadership programs on American Muslims. 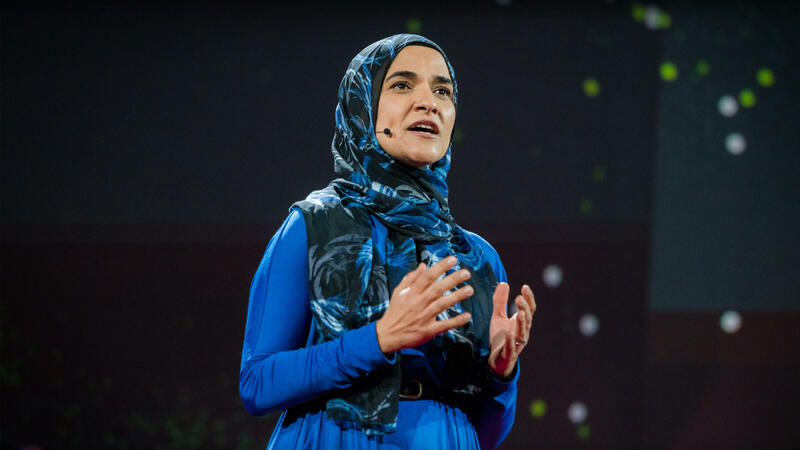 Previously, Mogahed was the Executive Director of the Gallup Center for Muslim Studies — where her surveys helped challenge myths and stereotypes of Muslims. In 2009, she served on Obama's Advisory Council on Faith-Based and Neighborhood Partnerships. Have you ever experienced hatred or - I mean, have you ever - I don't know. Has anybody ever said something to you because of who you are, because of your faith that has just been so incredibly hurtful? DALIA MOGAHED: Yes (laughter), all the time. MOGAHED: Physically - well, in the virtual world, it happens every single day. But there's also been the physical world where - I mean, a recent incident in a coffee shop where a man just started spewing the most unbelievable - I mean, I can't repeat what he was saying. MOGAHED: Absolutely. I didn't even know he was talking to me. And then he was looking right at me. And so I was, like, confused. Then I looked at him, and I'm like, sir, excuse me. Are you talking to me? And he said, yes, I'm effing talking to you, you effing X, Y, Z.
MOGAHED: This is my country, and I'll say what I want. I'm going to say the truth. RAZ: Dalia is Muslim, and she wears a hijab - and something that she's done since she was 17. MOGAHED: And that's still what I wear today. I cover my hair and my body. It is about speaking up, being open, coming out as a Muslim and having pride in that identity and not being afraid for people to know who you are. RAZ: Today, Dalia is the director of research at the Institute of Social Policy and Understanding. MOGAHED: It's a think tank that focuses on the American Muslim community. RAZ: So now - speaking out, it's actually part of her job - to educate, inform and to help others find the voice to stand up for themselves. Here's Dalia Mogahed head on the TED stage. MOGAHED: What do you think when you look at me? A woman of faith, an expert, maybe even a sister. Or oppressed, brainwashed, a terrorist. Or just an airport security line delay. That one's actually true. MOGAHED: If some of your perceptions were negative, I don't really blame you. That's just how the media has been portraying people who look like me. One study found that 80 percent of news coverage about Islam and Muslims is negative. And studies show that Americans say that most don't know a Muslim. I guess people don't talk to their Uber drivers. MOGAHED: Well, for those of you who've never met a Muslim, it's great to meet you. RAZ: I wonder - I mean, you obviously - you know, you are - you've spoken on stages, and you've talked about discrimination and about Islamophobia. And when did you decide that you had to speak out? When did you decide that, I can't just be silent - I've got to do something? MOGAHED: You know, I was very active in this area in college, and I kind of went into hibernation. I graduated. I started a job in a big corporation. I got married, had my first baby and was just living a really quiet, private life. MOGAHED: And then that horrific morning of 2001, where we were attacked as a country and, really, as a faith community. And that morning, I think everything changed. MOGAHED: I remember the first Friday after 9/11. I had to decide whether or not to go to the mosque. And at the time, there were actually a lot of threats against Muslims. And I remember the decision that me and my family made at the time was one of putting faith over fear. We were not going to allow these terrorists to tell us how we were going to be an American. And so we - nervously - but still went to the mosque that Friday. And what we found wasn't an angry protest or violence. We found half the congregation were people of other faiths that came to stand in solidarity. And really, that act of courage and compassion on the part of all of these neighbors inspired me so much. And from that moment on, I felt that I had to dedicate my life to building bridges and bringing about better understanding. RAZ: When you speak out and you talk about unfair perceptions and misconceptions of Muslims in the media and misunderstanding of what Islam is all about, do you think that perceptions are changing? Do you think that when you speak out, it's going to change minds? MOGAHED: I absolutely know it's going to change minds because it does change minds. And I've had an outpour of people who've written me and said that their minds were changed. Every single letter brings tears to my eyes, people who say, I used to be Islamophobic; now I'm not. Literally, people telling me that. So education can really change minds. And so I come at this from a very specific perspective. And when I speak to people, it is from a place of generosity. It is not from a place of need. I want to give them something. And when you approach people from that place of generosity, they respond very differently than when you approach them from a place of need or a place of antagonism. MOGAHED: I do think, with every fiber in my body, that Islamophobia is a threat to every American. And it, yes, something that will hurt Muslims first, but it is symptomatic of a wider problem. It is a rise in fear. Fear kills freedom. When people are afraid, they are more likely to accept authoritarianism, conformity and prejudice. MOGAHED: When you look at when anti-Muslim sentiment spiked between 2001 and 2013, it happened three times. But it wasn't around terrorist attacks. It was in the run-up to the Iraq War and during two election cycles. So Islamophobia isn't just the natural response to Muslim terrorism, as I would have expected. It can actually be a tool of public manipulation, eroding the very foundation of a free society, which is rational and well-informed citizens. Muslims are like canaries in the coal mine. We might be the first to feel it, but the toxic air of fear is harming us all. RAZ: How would you characterize the climate in America today for Muslim-Americans? MOGAHED: I've never seen it worse, and I've never seen it better. I've never seen it worse in terms of what's OK to say, kinds of policy proposals that are OK to discuss. But at the same time, I've never seen it better. I've never seen so much awareness of the problem of Islamophobia because it didn't emerge last year. It didn't start (laughter) with Trump. It is only now that people have stopped denying it exists. And what is so heartening to me is that if you look at American history, we've had lots of problems. And at first, we deny they exist. And they persist, and they persist, and they get worse. And then finally, we recognize their existence - things like racism, sexism - and then we we work on them. At least we have a process for that. And I think we will all come out the other side, perhaps exhausted but, I think, a better people, a better country after this is all over. RAZ: Doing what you do is like - takes a lot of emotional energy - right? - because you get attacked, and you put yourself out there. I mean, your life would be infinitely less complex if you just kept quiet - right? - if you didn't say anything, if you just kept your head down and went through life without speaking out. MOGAHED: It would be infinitely, yes, less complicated. But I would also cease to be myself. And I wouldn't even know who I was if I lived that kind of a life. I feel this is what I'm called to. Bearing witness to justice is what my faith demands of me. And is - it is what I hope to have the privilege to do for the rest of my life. RAZ: Dalia Mogahed - she's the director of research at the Institute of Social Policy and Understanding. You can see her full talk at ted.com. WILLIE NELSON: (Singing) Words that feel, words that sympathize, words that heal and understand - say them now. Let them materialize. Say the words throughout the land. RAZ: Hey, thanks for listening to our show Speaking Up this week. If you want to find out more about who is on it go, to npr.org. To see hundreds more TED Talks, check out ted.com or the TED app. Our production staff at NPR includes Jeff Rogers, Brent Baughman, Sanaz Meshkinpour, Neva Grant, Casey Herman, Jinae West, Rund Abdelfatah and Rachel Faulkner with help from Daniel Shukin. Our intern is Thomas Liu (ph). Our partners at TED are Chris Anderson, Kelly Stoetzel, Anna Phelan and Janet Lee. If you want to let us know what you think about the show, you can write us. That's tedradiohour@npr.org. You can also follow us on Twitter. It's @tedradiohour. I'm Guy Raz, and you've been listening to ideas worth spreading right here on the TED Radio Hour from NPR. NELSON: (Singing) We never do. We look for love. We find it in the eyes, the eyes of me and the eyes of you. Transcript provided by NPR, Copyright NPR.